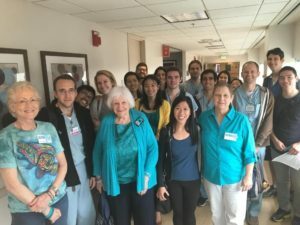 Ovarian Cancer Research Foundation Alliance’s (OCRFA) nationwide education program, Survivors Teaching Students,® (STS) brings survivors right into healthcare classrooms to share their personal stories of how they were diagnosed, what happened and where they are now. The goal is to increase the students’ awareness of the symptoms and risk factors for the early detection of ovarian cancer. 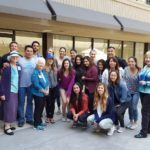 Since December 2008 through 2016, OCA of San Diego has helped educate the medical community through presentations to over 4,800 medical students, residents, nursing students, practicing medical physicians and healthcare providers throughout San Diego County. 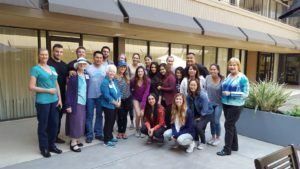 OCA of SD’s Team Members (in teal) surrounded by the students at Azusa Pacific University School of Nursing (above left) and UCSD School of Medicine Third Year Medical Students (above right). Click the video below to hear an interview on KUSI with Cindy Silver, an ovarian cancer survivor. Click here to see photos from our past Survivors Teaching Students® programs. For questions and / or comments about the Survivors Teaching Students® (STS) program, please email STS@ocaofsd.org.